There's no doubt that Facebook Fan Pages are an absolutely gold-mine for t-shirt marketers. Not only as a traffic source to sell your t-shirts, but also for gathering vital market research. There's a whole lot you can learn from the way successful marketers are selling t-shirts. 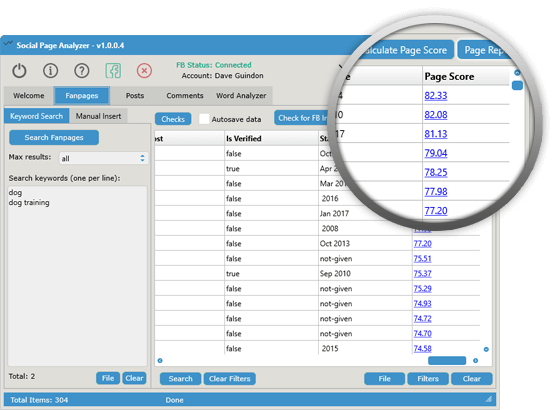 We previously covered an awesome research tool called Audience Analyzer. It's the best tool for finding profitable keywords, niches and audiences for t-shirt sellers. You will benefit greatly from digging into Fan Pages gaining further insights. If you know what you're doing and spend a long time searching, you'll uncover hundreds of Fan Pages full of wildly popular designs to inspire you. Better yet, you'll see all the comments from customers and potential buyers providing feedback. While it's certainly worth the time investment, the process of finding these Pages and analyzing them is arduous. Facebook's front-end doesn't lend itself well to the type of organized, laser focus research that we TeeSpys need. This is the latest, greatest way we've found to analyze Facebook Fan Pages. Powered by Facebook's own database via API, it provides a lightning fast, easy to navigate interface for finding the best performing Fan Pages. 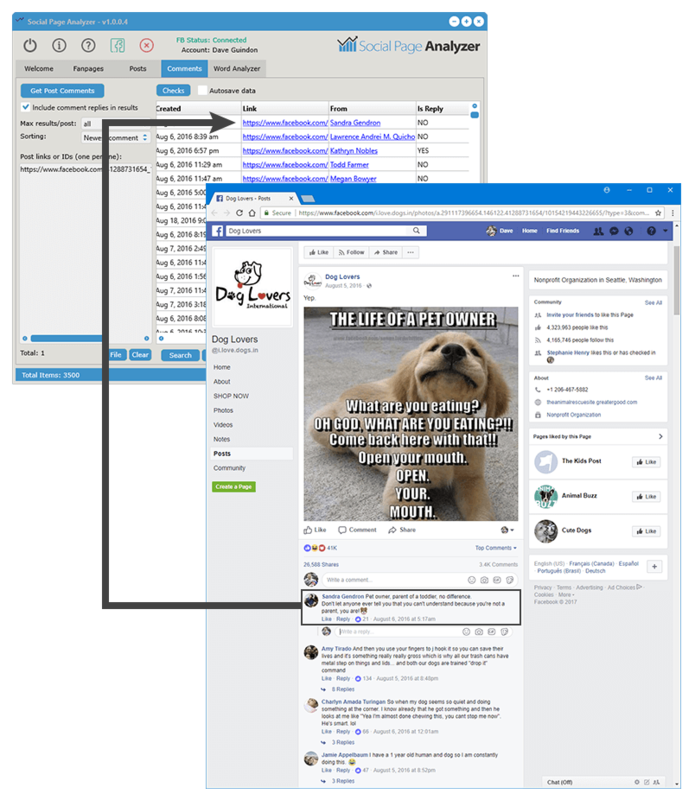 But Social Page Analyzer drills further than any other tool we've seen, allowing you to drill down into the most engaging posts and comments. Forget tiringly scrolling through Facebook for Fan Pages by hand. Once you've used Social Page Analyzer to do this, you'll never be able to go back. The software has access to the full Facebook internal database and enables you to browse through 1000's of Fan Pages in minutes. What's more, you can organize all these pages in a purposeful so you can focus on those that are performing the best. You'll quickly gain a wealth of knowledge without manually searching and collating data yourself. Plus you can easily organize and filter these Pages according to each metric. Emails and websites for every Fan Page are clearly displayed if you wish to contact page owners to build relationships. 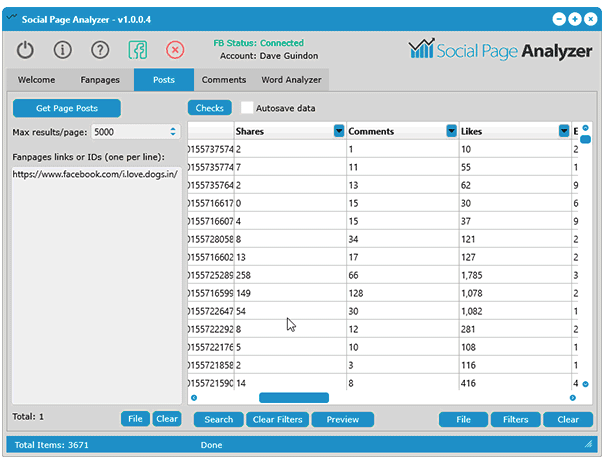 Social Page Analyzer is hands down the best Facebook Fan Page research tool we’ve seen to date. Not only due to the ease of use, filtering options and organization but the sheer power of the tool. 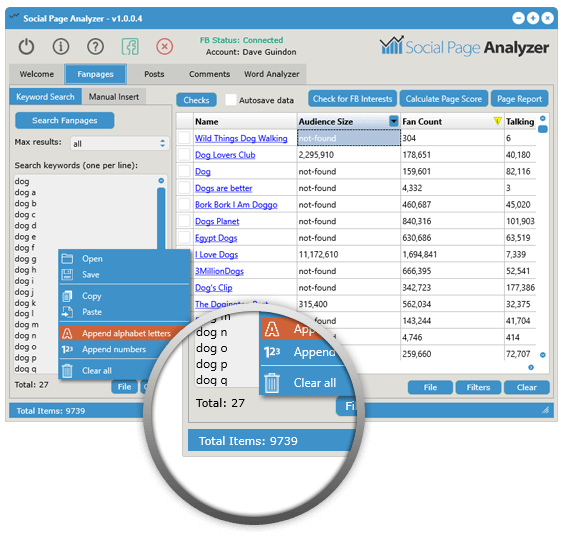 While most research tools can only pull of 500 pages or so, Social Page Analyzer can blast through almost 10 times more. You're not going to miss a profitable page with this one! Another feature we love is Page Scores. 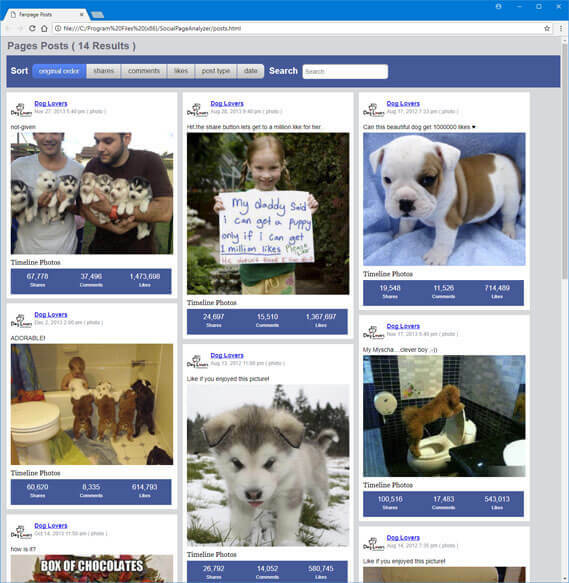 Social Page Analyzer uses a sophisticated page scoring system to help highlight the most valuable Fan Pages. At a glance, you'll see each Fan Page has been given a Page Score. But it doesn’t just stop at a simple number score. Full Page Score Reports can be viewed for any Fanpage. You might consider running this on your own page to see areas of improvement, or competitors to see how to beat them! 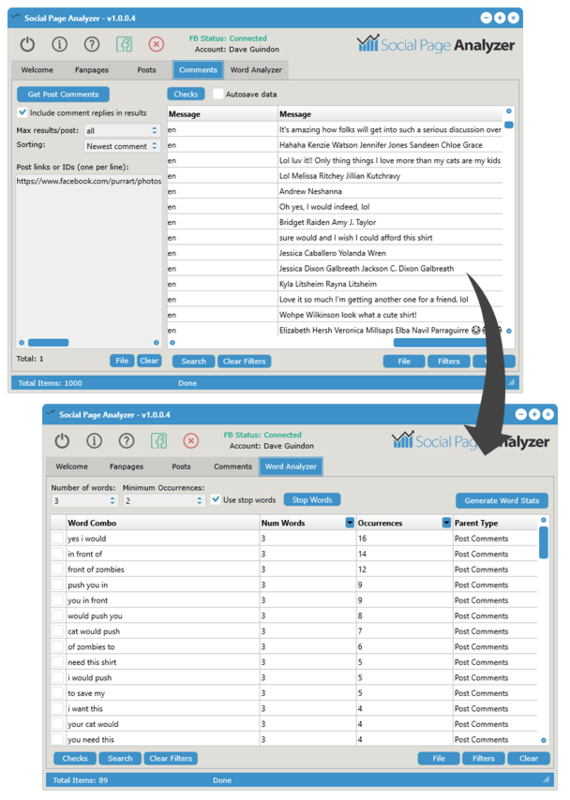 Social Page Analyser goes all out by retrieving and sorting all Page posts to help identify exactly what’s working and what’s not. Once you’ve identified interesting Pages, you can use the Post Tool to extract all posts within seconds. From here you can sort by shares, comments, likes or whichever metric is most important to you. Finding the most engaging posts has never been easier thanks to the engagement scale and engagement rate metrics. This feature is like nothing we’ve ever seen before. Clicking “preview” arranges all the posts you've extracted on your default web browser in a beautiful visual feed. Now you can scroll through all collected posts in a more natural, visual way. But you can still sort them by likes, comments, shares, date or even filter by keywords. This alone could save you hours of scrolling through Fan Pages looking for the most engaging posts. 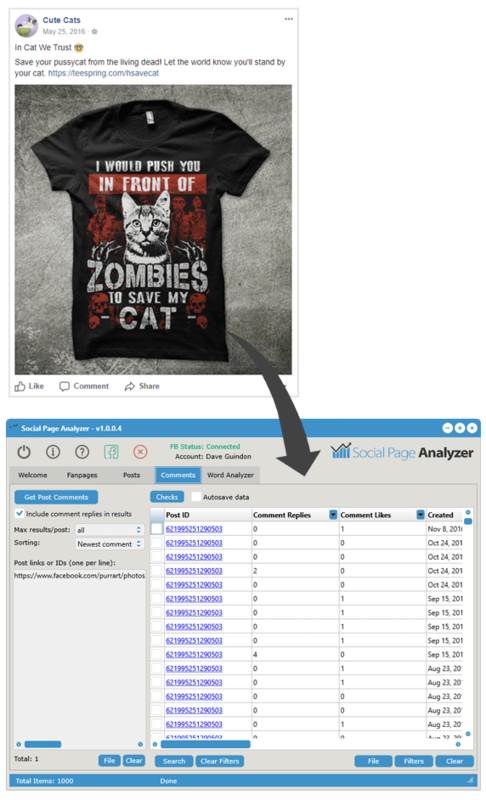 From Fan Pages to Posts and now down to Comments, Social Page Analyzer has you every step of the way. Just like previous steps, the Comment Tool will quickly extract 1000's of comments for you to analyze. You can sort by the number of likes, replies to find the most relevant and engaging comments. If you have 1000's of posts to look through, you can use the instant-search feature to speed up your search. Then if you want to see the actual comment on Facebook, all you need to do is click on the provided links. The Word Analyzer Tool takes your Facebook research even further. This tool enables you to instantly identify common repeating word combinations in thousands of posts and comments. If you want to know what customers loved or hated about products or promotions, this how to do it. You'll find ways to improve your own product, someone else’s or simply identify products that people love. By analyzing the reception of competitors t-shirt designs with their customers, you can repeat or beat their success. Or, you might hone in on the phrases used in the most popular posts and use them to boost your own engagement. You can even adjust a number of words per phrase to you're liking. We found 3-4 words per phrase to be the sweet spot. Here’s a quick run through of how easily this software can be used to come up with new t-shirt ideas based on winning designs. Closing Thoughts – It's a No-Brainer! Uncovering the most engaging Facebook Fan Pages, Posts and Comments is key to perfecting your own campaigns and t-shirt designs. Doing this manually is time-consuming and simply not an efficient use of time. 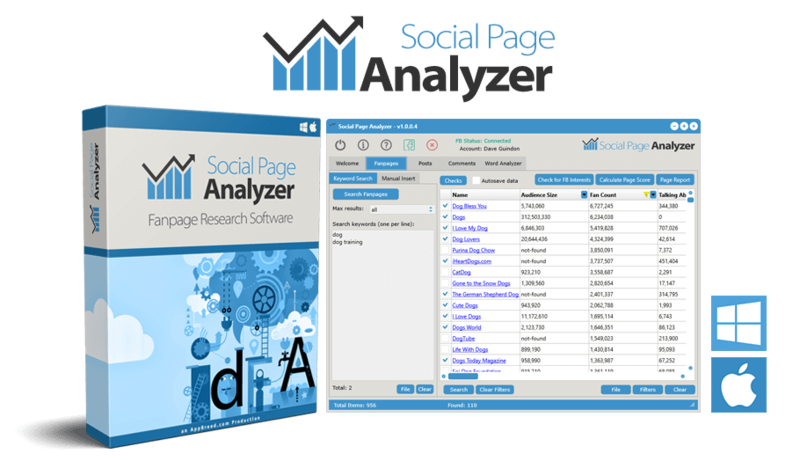 When it comes to performing Facebook Fan Page research, you need Social Page Analyzer in your life. This cutting-edge software is packed with awesome features that will save endless hours of research. It’s an absolute steal for the limited-time launch price of $67. Ready to take your T-Shirt campaigns to the next level? 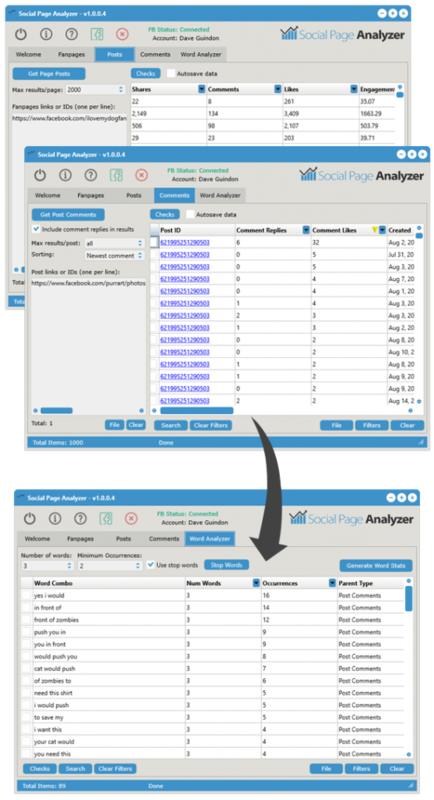 Go get Social Page Analyzer today with a full 30-day money back guarantee. If you didn't see our post already, you need to Audience Analyzer too. It's great for researching keywords, finding niches and audiences for t-shirt sellers.